Home / News / Why do volunteer programs fail? Nail down these 6 vital details in advance of your program launch for sweet success! 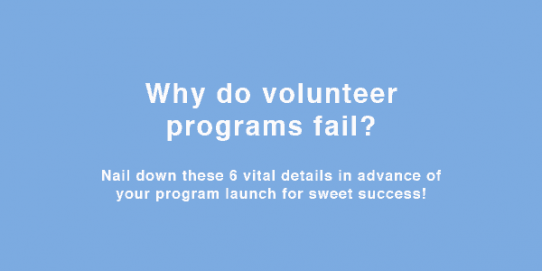 Why do volunteer programs fail? Nail down these 6 vital details in advance of your program launch for sweet success! Managing expectations can be one a challenge to master – you want to give the volunteers enough information to be prepared for their event work, but you don’t want too many details to be revealed as these details so often end up changing closer to event time, or even once onsite. It’s important to keep a flexible workforce without having to make changes to published information that affects the integrity of the program. These 6 program details are the cornerstone building blocks of any well-managed team – decide them early, and once published, never change them! Nail down the details that can not be changed, and carve them into stone! First, figure out what the absolute necessary information volunteers must have in order to successfully (and happily) complete their work shift onsite. This can include the Required Arrival Date and Time, Accommodation details, Meals, Job Requirements, Shift Times, and Perks. 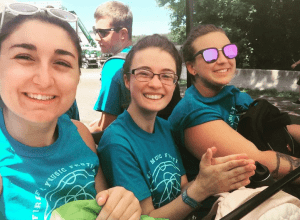 Of course the first few mentioned are no-brainers – it is vital for planning purposes that volunteers understand when they are required to be onsite at the event, and many events require Volunteer Check in prior to event gates. Volunteers should understand this requirement before committing to participate. Accommodation and Meals are basic needs that must be considered. If the event is out in a field in the middle of no-where, then a spot to camp, or some sort of transport to and from town, must be considered. Meals should be considered for longer shifts, or shifts that are before of after food vendors are open. Of course, providing meals to volunteers is great perk and should always be offered when possible! Job Requirements may be necessary in some situations, such as long standing shifts, or even long standing overnight shifts, or perhaps shifts that require lots of walking/bending/stooping. Or perhaps there are shifts that require manual labor. These details should be provided to volunteers prior to confirming them into the program, as some volunteers might not be well suited to certain work conditions or tasks. Shift Times are necessary in advance so that volunteers can properly plan to be ready to attend shifts, and of course so they can plan their ‘off’ time with their friends! What may NOT be necessary is what they are going to be doing ON shift… keeping this detail hidden until shift check in allows the program manager to re-assign workers to other departments as the need arises, without having to deal with broken volunteer expectations (moving Sally from a VIP shift to a Parking shift might not be received with such glee, and could dampen her volunteerism gusto!). Ahhhh the Perks! Nailing these down and then actually providing them is essential to maintaining program integrity. 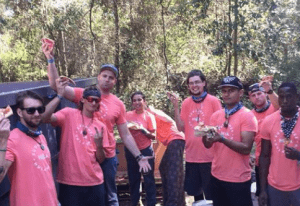 Perks include lodging, meals, t-shirts or other swag, event passes, food & bev tickets, special privileges and more, and are the main program marketing tools and usually the main reason behind a volunteer’s initiative to join the team. Perks are super important to program recruitment, but here’s the thing: PERKS PROMISED MUST BE PROVIDED!!!! I can’t stress this point enough – if your program expects the volunteers to keep their promise and work their shift with happy motivation, then your darn-tootin’ the perks promised better meet expectations. <— yes that’s right :: MEET EXPECTATIONS. That means that if meals are promised and volunteers get a PBJ sandwich, that’s not going to meet their expectation of a meal (unless your program is made up of toddlers). So in arranging with the event the perks that the program will offer, be sure to decide on enough perks to recruit ample help, but be sure that the event will follow through on their end of the deal! Nailing down these 6 details, publishing them at program launch, and never, ever making changes to this vital information will ensure your program is a success and has a platform of integrity to build off of year after year.